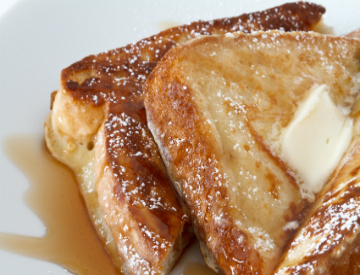 French toast is supremely satisfying in the morning, as is coffee. What if you could combine the two? The result would be a completely delicious breakfast treat known as Coffee Caramelized Croissant French Toast Sticks. Sound appetizing? We thought so! Read on to learn how to make this remarkable dish using our Hawaiian Ka’u coffee and a few other simple ingredients. When making the coffee for this recipe, it’s essential to get it as strong as possible. We recommend making it in an espresso maker if you have one. Otherwise, you can use a French press or drip coffee maker, and just add twice as many coffee grounds as you normally would. Prepare the coffee maple syrup by combining 2 tablespoons of coffee with the maple syrup in a saucepan. Bring it to a simmer, let it simmer for 5 minutes, and then set it aside. Begin making your French toast by slicing each croissant into 2 or 3 strips. Set them aside as you combine the butter, brown sugar, and 1/4 cup coffee in a small bowl. In a second bowl, combine the remaining coffee, eggs, milk, vanilla and cinnamon. Add a few spoonfuls of the butter mixture to a skillet. Then, dip 4 – 6 croissant pieces into the egg mixture. Fry them in the skillet until caramelized. Repeat until all of the French toast has been made. Serve with the coffee syrup on the side. Visit Hawaii’s Local Buzz to order some of our Hawaiian Ka’u coffee for yourself! It’s delicious in recipes and on its own.